Hoya is a genus of 200-230 species of tropical climbing plants in the family Apocynaceae, Native to southern Asia, Australia, and Polynesia. The Common names are waxplant, waxvine, waxflower or simply hoya. Hoya is one kind of beautiful veining houseplants. This easy and fast growing plants have a wide variety of leaf shape and color. Most of them have thick waxy leaves and clusters of beautiful star shaped flowers with very strong fragrance. Hoya can grow up to 15 feet long, so it can be either a hanging plant or a trailing plant. The older the plant the more magnificent the blooms. A hoya plant likes to be root bound so do not repot a hoya until it is absolutely necessary. Hoyas like bright light, not direct sun. They require average humidity but the foliage (when the plant is not in bloom) can be misted with water if the humidity is low. The leaves will become wrinkled when there is not enough water. Fertilize during the growing season every month. Propagate Hoya through stem cuttings is one of the easy ways. It will take a few years however for the plant to produce flowers. Sometimes people have difficulty in getting their hoya to bloom. 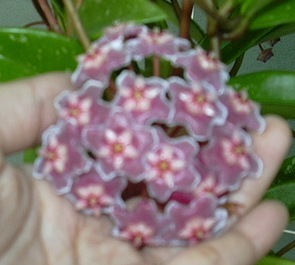 Lack of light can also prevent a hoya from blooming. Once in bud do not disturb the plant by moving it. After it has finished blooming do not remove the dead flowers because it will re-bloom on the same spurs as before and also do not prune off any leafless vine extensions. This is my hoya plant in its 3rd years, I grow it from one short stem with two leaves only. It bloomed once before. 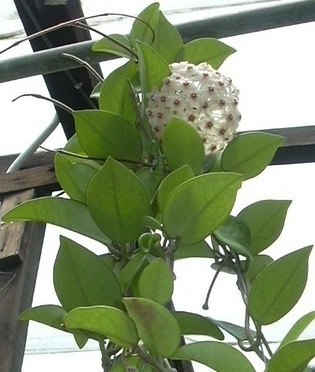 When a hoya is growing the new growth is a leafless vine and then the leaves will appear later. If you want to groom your plant you can prune it by cutting just above the last set of leaves so that you are not leaving a stump. You could use the discarded vine for a cutting if it is mature. Cuttings should be cut just below where the leaves join the stem, removing the bottom leaves. Place this part in the soil and have the next set of leaves be above the soil. You only want one set of leaves above the soil so clip the cutting just above the second set of leaves. Hoya Kerrii in one of my favorites, it is a beautiful climber with heart shaped green and varigated (hybrid) leaves. It belongs to the Asclepiadace plant family. I was told the flowers are very pretty but I have never seen it before. The species is found in Thailand, Laos and Cambodia. This plant is the perfect plant gift for Valentine’s Day. Hi! May I know where to get Hoya Carnosa in Singapore?